I've been playing around with fermented dough and batter lately. Not just in bread, but generally - there's no reason why you shouldn't ferment your cake batter, too. Dough and batter with baking powder does not help break down the anti-nutrients like phytic acid in whole grains. Phytic acid is necessary for grains to sprout; it binds minerals - which is not desirable in our organism, though, because we want to use the minerals. Soaking and fermenting helps reduce phytic acid in whole grains. Sprouting is great, too, but actually there's no way to convince rolled oats or brown rice flour to germinate. So it's fermentation which we want for this. 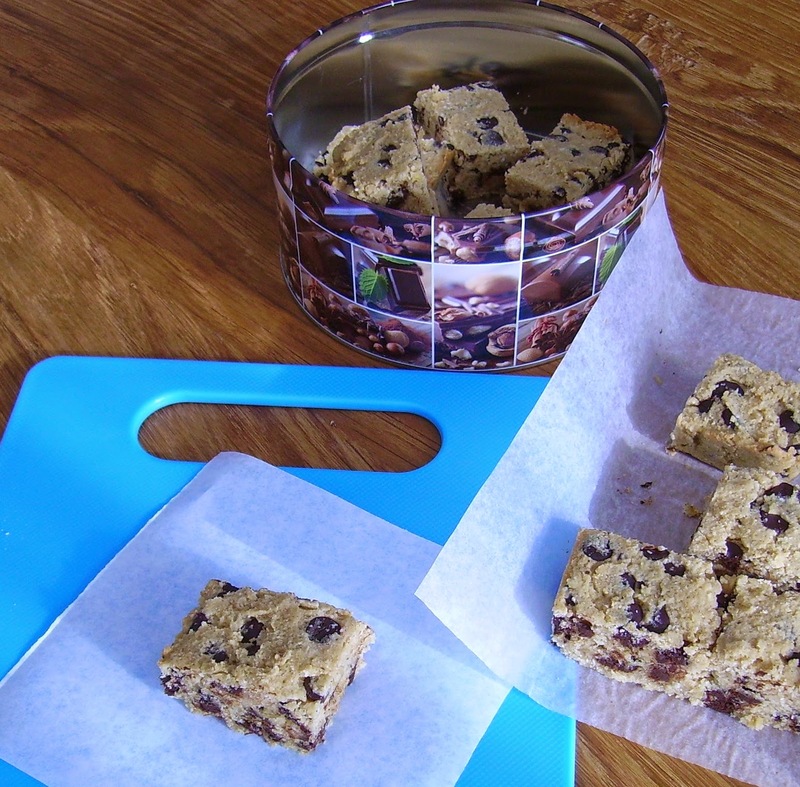 I had made these chocolate chip bars several times already when I had the idea to let the dough sit overnight so that at least some fermentation could take place. 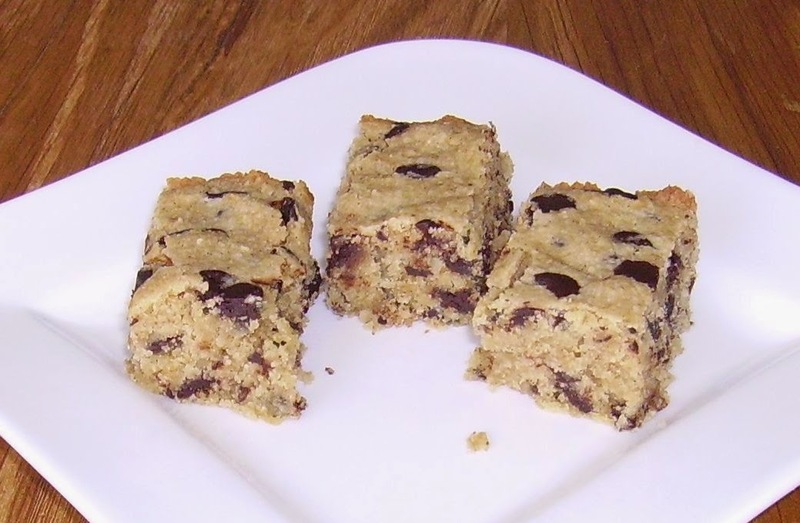 The result was terrific - the bars are so moist and yummy that I'll never make them the old way anymore! In the evening, combine 3/8 cup rolled oats, 1/4 cup almond meal, 3 tbsp. yoghurt, 1 tbsp. water and 1 tbsp. coconut sugar or rapadura sugar. Mix well, cover and let stand in a warm place overnight. In the morning, preheat oven to 160°C or 320°F and line a 4x8 inch pan with baking paper so that the paper overlaps the rim of the pan. That makes removing the cake easier. 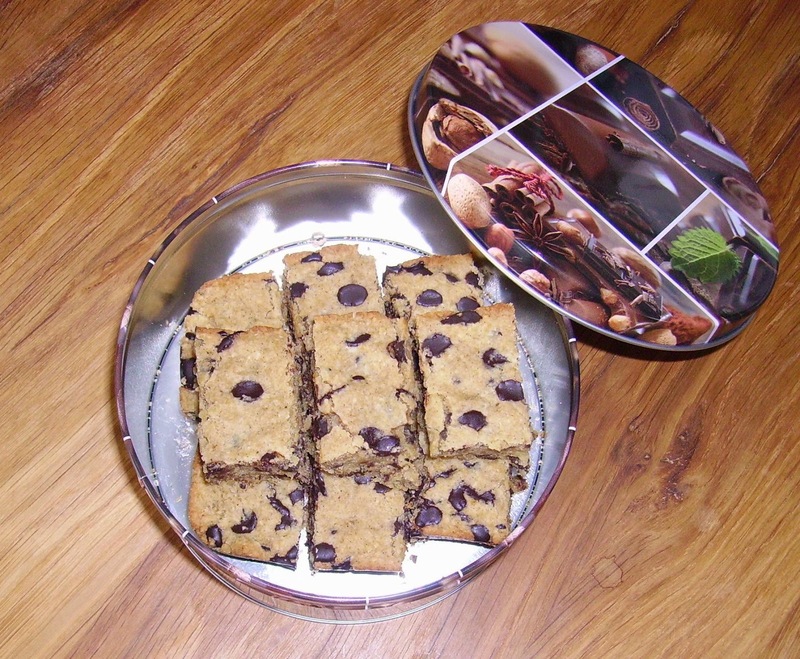 Combine soy flour, coconut flour, erythritol (or sugar), stevia to taste, vanilla, baking powder, chocolate chips and add to the fermented dough. Add another tbsp. yoghurt and 4 tbsp. olive or coconut oil. Mix dough well (I do it with my hands) and press evenly into prepared pan. Bake at 160°C or 320°F for 30 minutes. Let the cake rest in the pan until it has cooled considerably, then remove from pan and cool on a rack. Wait until it's completely cool - yeah, that's hard, I know. But it crumbles less if you wait. So wait until it's completely cool before you slice it as you like. Have you ever tried Amish friendship starter or Hermann cake? Do you know a good gluten free version?